The Cyclo Intro Brush Kit removes spots and stains from carpet with the powerful scrubbing action of two rotating heads. Just spray the desired area with our favorite carpet cleaner and let the Cyclo do the work for you! This kit gives you the option of the Cyclo standard model with one speed or the Cyclo 5-Pro with variable speeds. You can also choose your capet brushes (2 of the same type). You get all this at a great savings! The Cyclo Polisher has two orbiting heads that move in an orbital motion, counter-clockwise. The idea is to simulate hand polishing but at a much faster rate. Going over a scratch or swirl with both heads ensures that you are attacking it from all sides, so to speak. No matter what angle you look at the paint, it will look flawless! The Vibration Elimination System (VES�) is available exclusively on Cyclo Dual Head Orbital Polishers. This system is composed of a counterweight and precision matched, weighted inserts. VES� nearly eliminates the amount of vibration felt by the operator. This drastic reduction in vibration lessens muscle and joint fatigue for the operator. The counterweights are pre-installed on the Cyclo. The Silver Weighted Inserts perfectly balance the weight of Cyclo�s DoublePrecision Pads and Cyclo Scrub Brushes to provide the operator with a smoother motion with virtually no vibration. 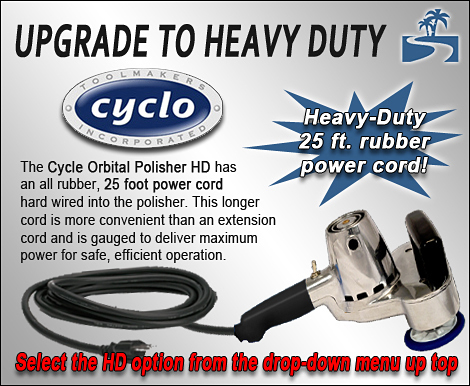 The Vibration Elimination System (VES�) is available exclusively on Cyclo Dual Head Orbital Polishers. Always install the Silver Weighted Inserts onto the Cyclo when using the carpet brushes. 2 Cyclo Carpet Brushes - Your Choice! Cyclo brushes are available in four varieties. Grey Ultra Soft Brushes are for the most delicate carpet and upholstery and headliners. Aqua Soft Carpet Brushes are all-around carpet scrubbers for auto and household use. White Standard Carpet Brushes have stiffer bristles for more rigorous scrubbing on carpet, tile, grout, and floor pads. Black Stiff Scrub Brushes are very stiff. Use them for intense scrubbing of hard surfaces, like stone, grout, tile, and truck bed liners. Use the drop down menu in the order box to select your brushes. To attach the brushes to your Cyclo, remove the heads using the flat wrench. Screw the brushes into the machine and tighten with the wrench. When you are finished using the brushes, unscrew them and rinse them out. Allow the brushes to air dry. A total retail value of $365.93. Save $40.93!